HyperLaw is delighted to announce that Ben Washburn has successfully completed the CX Professional Masterclass delivered by world renowned Customer Experience Specialist Ian Golding, on behalf of the Customer Experience Magazine. The two-day intense course dives into all aspects relating to Customer Experience and sheds light on how to apply it effectively in your business. For instance, you gain valuable insight in how to implement a Customer Experience strategy, how to create a Customer Experience culture, how to improve Customer Experience in your business and most importantly how to map customer journeys so that a consistent and lasting experience can be provided to each and every customer at every step in the customer journey. We view our customers as the heart of our business and we take immense pride in always trying to provide them with a consistent and lasting experience no matter what stage they are at in the customer journey. Completing this course furthers Ben’s skills and knowledge in Customer Experience and we look forward to seeing him implement this in our business moving forward. “This is fantastic news, and evidence of the positive motivation we have as a Business to provide all our customers with the very best experience that we can possibly give them. It is a primary objective of our Company to be the number 1 provider of Legal Technology services in the Intelligent Case preparation market – and one of the ways we will deliver this is through the relationships and value that we build with all our Customers and partners. Customers are the reason we exist and they deserve outstanding service first time every time. 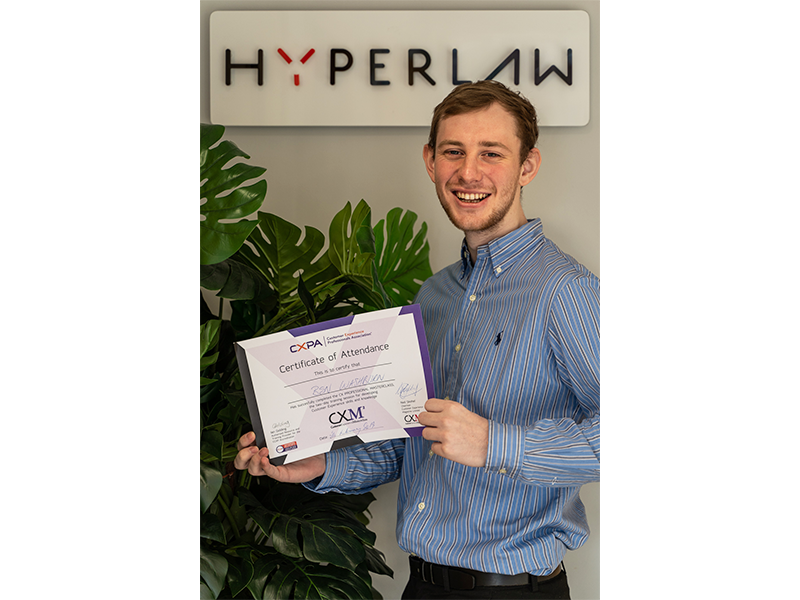 Congratulations Ben on behalf of everyone at HyperLaw!